The staff of Tamarack Assisted Living Center are wonderful. They strive to take very good care of our loved one. They are courteous and very kind to help visitors and the residents. They print facebook post for our loved one and also share Tamarack news, activities, and fun things with us through facebook. They are #1 in our book. We appreciate each of them very much. Thank you. You mentioned printing face book pictures for your loved one and posting pictures of things happening at Tamarack. That is just one little thing that we can do to keep Tamarack residents connected to family. We appreciate your wonderful comments! My family loves Tamarack. They take such good care of my mom. She feels safe and happy there which makes us feel good about our choice. The food is great and the staff is always so nice and helpful. She loves that they take her to get her hair done every week and to run other errands when necessary. We couldn’t recommend Tamarack enough!! Thank you, Jaime! We love your mom, and she is always ready to GO! We love it when you come visit, too, because you bring a breath of fresh air and sunshine to everyone! It is always a difficult time in your life when you have to find a place for your loved ones to stay due to age or health situations. That is what happened in our family. Because of health situations dad came to live at Tamarack first. The care for him was exceptional and he enjoyed every minute that he was there. Shortly after he arrived mom injured herself and found it time to find a place for herself to stay also. It was nice being able to put them next to each other in private rooms since a larger one wasn't available at the time. The care for Mom has been top-notch as well. There are always activities going on and the staff is always very attentive to the needs of our family members. 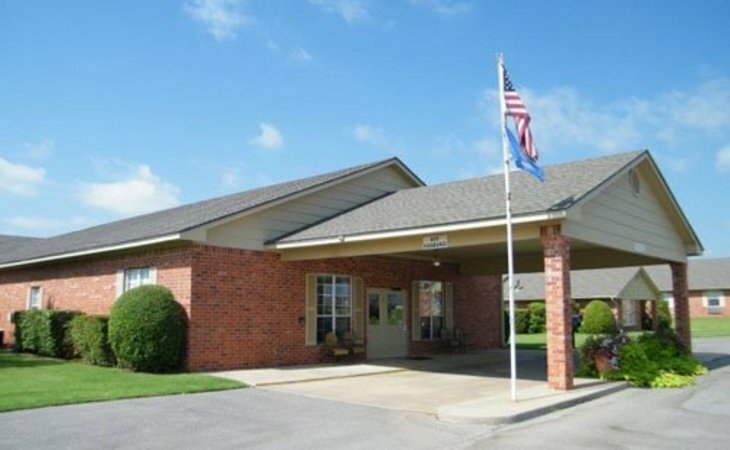 We feel like there is no other/ better place for our family to live than Tamarack Assisted Living in Altus, Oklahoma. Thank you for easing our minds about the care our loved ones recieve at your facility. Tamarack is great!! Thank you, Gayle. We appreciate your review, and we will continue to give service to your mom. It was a privilege having your dad here, and it's still great having your mom! Let us know anytime you have any questions. I have been to Tamarack Assisted Living many times to present programs and visit friends that are residents. The apartments are extremely clean and spacious. The gathering ares are beautifully decorated and also extremely clean. The food is excellent and very near gourmet quality. The care the residents receive from the staff is second to none. Each resident is respected and loved. The employees encourage their residents to attend all events and even take them to events outside the facility. I believe the residents are considered to be family and treated as such. I highly recommend Tamarack Assisted Living as a quality facility and a place our loved ones can be proud to call home. If you are looking for a place to store a love-one that has become a burden, you are looking at the wrong place. Tamarack is home with a family that cares for each other. We have a full staff of professional care givers that are with us 24-7, we have free transportation, those of us who still do our own driving have free car port parking. Tamarack is the best assisted living facility that I have seen. I researched facilities in TN and MI and I found nothing that compares. Our (home) (facility) is one of the few facilities that has full energy generator power backup support. We are free to come and go as we desire. GREAT PLACE. I have been here for a little over 3 years. The food is very good. This Is the only facility that I know of that is video monitored 24/7 for security. Thank you!!!! We agree that you don't "store" people at Tamarack. People enjoy living at Tamarack and they do make it their home and family. We are glad that you like our transportation, carport, generator, good food, coming and going as you please, and video monitoring. YOU add so much to Tamarack because you are our resident photographer, and we love and enjoy the pictures that you take and share! I can't say enough about Tamarack Assisted Living Center in Altus, Oklahoma being such an excellent home. Living out of state, I frequent the center on Facebook because I know some of the residents and love seeing them so happy and being well taken care of and respected. The facility is such a delight to keep up with the numerous activities they have for our seniors. It is so enjoyable to see everyone happy and enjoying life. There is a resident photographer and flower gardener that are among those that call Tamarack Living Center their home. The administrators and staff members are very busy keeping activities going and it is a pleasure to see all the smiling faces of the staff members as well as the residents and administrators. I enjoy the contests being done all through the year pertaining to the seasons/holidays. We have an "out of state" family member who is in need of this care and I have highly recommended to their caretakers to, please, consider making their loved one a home with Tamarack Living Center. Thank you, Lawana. We are so glad that you are able to keep up with your friends at Tamarack on Facebook. We appreciate all the comments that you make to us on FB, and we are so glad that you are one of our followers. Keep it up!!!!!!! Come by and visit any time you are in the area. Thank you for the review! My parents moved to Tamarack May 2017. They were hesitant to leave their home of 45 plus years. Now they are pleased to call Tamarack their home. The staff was instrumental in making my parents feel welcomed and comfortable. Knowing the care they receive gives my family peace of mind. Thank you for your review. We LOVE your mom and dad, and we are so glad that they are here!!! They are a joy to us. Don’t ever hesitate to contact us if you have any questions or concerns. My mother is living in Tamarack now. This is her second time here. She came originally after an injury that kept her from being home. She was actually very torn when it came time to leave, but she had healed enough to go home. It was her plan then to return to Tamarack one day. She loves that the staff is so caring and compassionate. I love that they care for her like family. I sleep better knowing that she is in such good hands. We have loved your mom both times that she has lived at Tamarack. She is a joy and friend to so many people. We appreciate that you say that she loves that “the staff is so caring and compassionate”, but we want you to know that it’s easy to be caring and compassionate to such a sweet lady. She and I also have a mutual love of books, and we often share books. Thank you for your review. My Grandma lives at Tamarack & absolutely loves it. The nurses take very good care of her & there are always great programs & fun things for the residents to participate in. It is always clean, bright & cheery there. The director, Mary works very hard to keep sure the quality of life they provide for the residents is top notch. She is one of the most sweetest, caring people I have ever met & my family & I have known she & her family for a long time. I would highly recommend Tamarack to anyone & everyone! We love Tamarack! Marty, thank you for your review and all the sweet things you said. You say that your grandma loves Tamarack, and we LOVE your grandma. She is such a great lady. She doesn’t like to miss anything that we having going on. It is so much fun to have activities and have enthusiastic participants like your grandma! We also love it when you and your precious children come to visit and when you post your own pictures of all the grandchildren with her!!! I have family member who lives here. It was an enormous change in our family. It wouldn't have been possible for this change to happen without the assistance of all the administration and staff to help our family member comfortable and most of all welcome. During the early transition period every question we had was dealt with promptly and with great care. Every need has been met. I am so thankful Tamarack was there and is there to care for our loved one with dignity and respect. We are glad that we can be here for you, and we do want to keep dealing with things “promptly and with great care.” We take great pride in Tamarack Assisted Living Center. Thank you for your review. I have visited Tamarack many times over the years - to visit residents and also with our church choir, to present Christmas music for the residents there. It is a wonderful place, always beautifully decorated and furnished. When the choir is there, we always feel welcomed by the staff - they graciously accommodate all the needs that our group has. That presentation of our Christmas music at Tamarack is always a highlight of the season for me! When my mother and father-in-law decided that it was time for them to move into an assisted living center, we were happy that they chose Tamarack.. Even though they have only been there a short time, we are very impressed with the care and service that they receive. Mom and Dad are happy, and always mention the attention and care they receive, The staff are pleasant, considerate and seem to want to make things the best for all the residents., I agree with another reviewer - the people make the difference! The staff and administrators are welcoming every time and the residents we encounter are friendly and seem happy. That is an sign of a great facility! We just held Mom and Dad's 70th Anniversary party at the center last weekend. ; the activity room was a perfect place to host a party! We highly recommend Tamarack! Thank you so much, Tim and Kathy! We have appreciated your Christmas Cantata presentations over the years! They have become tradition at Tamarack now, and they always are a highlight for us, too!!!!! We LOVE your Mom and Dad! They are an awesome couple, and it was such a privilege to get to share in their 70th anniversary party. What a special and precious couple..............still so in love after all these years! Thank you for putting your confidence in Tamarack, and they you for the wonderful recommendation! We agree with you that "the people make the difference"!!! All your family are a part of those people that make such a difference here! The staff is the best, the facility is second to none and all my friends who live there seem very pleased. I hear many excellent comments throughout the community about Tamarack. Thank you! Please come again and visit your friends! My parents moved to Tamarack in August 2015. My mother has Alzheimer's and my father was in poor health. The staff at Tamarack are excellent. I don't worry anymore like I used to when they were living at home as I know the staff at Tamarack are there to assist them with any additional help they need. They engaged my mother in all kinds of activities, which has kept her mind alert. I couldn't ask for a better place and staff to assist me with caring for my parents. Thank you for your review! We are so glad that we have made your life easier by taking some of that worry out of your mind. It just so happens that I have known them for many years, and it gives me a sense of joy to know that I can be a part of making their life better when because of the aging process things at home were too difficult for them!!!!! My Mom has been at Tamarack for better than 6 mo. now and is healthier physically, socially, and emotionally than she has been in several years!! The Staff,, friends she has made, getting well balanced as well as nutritional meals,and getting her meds in a timely manner has been a super big help in her health. Her disposition is so great that we love visiting and also visiting other residents. Such a positive environment, we couldn't ask for a better place for her to spend this time of her life. I truly hope that I can find a place like Tamarack if I ever need a place to live! Thankfully, we have seen such improvement with many people who have moved into Tamarack. People usually really prefer to stay at home, but home isn't what it used to be when the person was active and getting out in the community. The person isn't getting much social stimulation, and the disposition that you mentioned often tends to go down. Nutritional meals do make a big difference in health and as people age, cooking is not a priority. Eating is a social activity, and eating alone is not fun. Getting meds on time is very important, too. It's true that people who come to Tamarack end up visiting with a lot of the residents. Thank you so much for your review. We are very happy that we are here for your mom. Change is always difficult at first. For all of us, but even more so as we get older. Our Mom was at two other facilities where we found the care to be substandard. But when she settled into Tamarack it was like coming home! She LOVED it. She considered the caregivers her family. Everyone there seems to have one goal...to assist! Mom was treated like a celebrity! She had her meals prepared, apartment cleaned, laundry done, meds correctly given, and transportation provided as needed. She loved getting manicures, pedicures. There's a full service salon there too. They have fun activities planned and special events and entertainment. Even a church service on Tuesdays, and bus transportation on Sunday. But the best thing about Tamarack Assisted Living? The people. The tender loving care, the genuine concern for each one there. The residents watch out for each other too.. My mother resided at Tamarack for 6 years. She got her Promotion to Jesus just 2 weeks ago on August 1. The workers would go in to check on her frequently...and then go out in the hall to weep, knowing her departure would be soon. When she was in the hospital earlier, many of the workers came to see her...even the cook who was especially loved by Mom and all of our family. Several came to her Celebrstion of life ceremony and wept with us. Tamarack is not just another facility...its home. For most, it is loved MORE than home. Health improves, joy returns....the family is able to experience relief from stress over the care of their loved one. What a luxury to be free of constant worry!! Thank you so much for your review. We loved your mom, and she added so much to our Tamarack family. You mentioned the things that we did for her, but she did many things for us. One was LOVE US! She always had a smile and something sweet to say. She shared her love of God with us on a daily basis. She shared her love with other residents, too. We enjoyed her painting and musical talents, too! You are so right when you say "the best thing about Tamarack Assisted Living.....the people." The residents truly love each other and do watch out for each other. Please continue to come to visit us when you are in town! Not only do we miss residents terribly when they are no longer with us, but we miss families!!!!!!!! Luckily, a lot of them do continue to keep in touch and visit. I work in healthcare and have had family members as residents at Tamarack Assisted Living. I can honestly say that there is no other place that I would want my loved ones to reside based on my personal and professional experience with Tamarack. Every staff member at Tamarack is caring and compassionate and they really do anything they can to provide a wonderful environment for both the patients and the staff. Happy staff equals excellent environment. Everyone from the top administration to the dietary staff, to the maintenance folks do an excellent job and are always friendly, helpful, and attentive to both residents and visitors. The nursing staff is absolutely top notch with tremendous leadership. I've had family that have lived there and know many of the residents by name. Each and every one of them has always been thrilled to be at the clean, fun, and relaxing environment that Tamarack provides. I always think the highest compliment a long term living facility can receive is that you would want your parents to live there and there is nowhere else that I would want my parents to live when the time comes. Thanks to Tamarack for everything they do, every day! They are the best! Thank you so much! We CERTAINLY APPRECIATE your confidence in us from your being both an RN and a family member. We love our residents, and it is a privilege to get to know them and their family members. Family is always welcome at Tamarack, and it's pretty special that families come in and get to know and visit with many of our residents. Many people don't realize that if a person needs home health care, home health is available to people who live in assisted living just like it is available to people who live in their own homes. This adds another level of care for that person. We appreciate our home health nurses so much because we know what they can add to the care of our residents. Thank you for your review!!!!!!! My Aunt has been "home" at Tamarack for 3 years. Everyone here is so nice. All of the staff go above and beyond and I haven't met any of the residents that I didn't think we're top notch! Tamarack Assisted Living......you are the best! Thank you very much! We appreciate your sweet words, and we hope you know that you are welcome to visit your aunt any time. Having residents and family call us "home" is one of the best compliments that we receive!!!!!! My parents stayed at Tamarack Assisted Living for a short while. This facility breaks the stereotype of long term care living. The facility and staff were the best at making residents feel at home. They give the gifts that keeps on giving like dignity, respect and compassion. Thank you to all the staff for the wonderful care you provide each day to you residents. Thank you so much! We love what we do at Tamarack, and it was delightful to have your parents here. We had a really good visit at Tamarack Assisted Living Center. It’s a fantastic place. The staff was really very nice. I was very impressed with the facility. Thank you very much. Come back and visit any time! My mom got such great care while at Tamarack! I've visited in many assisted living centers in the Oklahoma City and Wichita areas and not one was up to the standards of care that Tamarack exhibits. Residents are treated in a dignified manner at all times and with much encouragement. Mom thrived in that environment of friendliness and helpfulness, loving all the residents and caregivers. Kay and Mary are top notch and keep things relaxed and make it fun for everyone, both the residents and their family members. Thank you so much! Your mom was an ABSOLUTE DELIGHT when she lived at Tamarack, and we LOVED all her wonderful family that frequently came to visit!!!!! The toughest thing is when a resident has to leave assisted living when they exceed assisted living care. We miss the resident and the family terribly! Come back to visit us any time!!!! My step mother has been a resident at Tamarack for several months and my dad is a new resident there following a fall and hospital stay early this month. I really appreciate the "heart" you see in the staff at the facility. They all try very hard to make the lives of our loved ones enjoyable and fun in their golden years. They were very helpful in helping my dad make the transition from the rehabilitation hospital to Tamarack simple. He seems happy and feels well cared for. As a child who lives several hours away, this gives me peace of mind. In addition, I appreciate the fact that staff will pick up the phone and let me know of any changes that may occur. Thanks for the great work you do. Thank you so much! It has been a pleasure to have your step mother here, and it's great to have your dad now. We're also so happy t have you as a part of what we consider our "Tamarack family". Don't ever hesitate to call us when you have a question about them or if we can help you. My grandmother was at Tamarack for several years. The staff are all wonderful! The facility is clean, well maintained, and welcoming. If you need anything, they will go out of their way to help you get it. We LOVED your grandmother when she lived at Tamarack. We still remember how "spiffy" she liked to dress with all her beautiful jewelry that she wore. We also enjoyed you, Christy, when you would come see her. You need to just come see us! My mother is a resident of Tamarack Assisted Living Center. Moving there was her choice. She knew she could no longer live alone and didn't want to live with her children. Our whole family is happy because she is happy. Several of her life-long friends are there and she meets new residents every day. The staff is WONDERfUL. They are all so attentive and helpful. She loves the food and taking part in the social activities. All her needs are met such as getting her hair done once a week, laundry service and rides to doctor appointments. There always seems to be something fun going on. Tamarack is homey and beautifully decorated. Mother says it's like living in a luxury hotel. Our family couldn't be more pleased with the facility. I look forward to living there someday. Thank you SOOOOOOOO much! Your mother is fun, fabulous, and a great addition to our wonderful residents! My Mom was a resident at Tamarack Assisted Living Center for approx. a year. She enjoyed all aspects of living there. Bingo, the Horse Races, and other activities take precedence over me at times when there was a hot bingo game! :) It made me smile when I knew she was having fun with her friends. She enjoyed both her new friends that she met as well as having great care keepers. I always felt that Mom was receiving the very best in care at all times. I noticed that the personnel took time to know the names of each resident as well as their interests, likes, etc. It was like living with a large family. I have a small Cocker Spaniel who loved going to Tamarack. I knew the residents who wanted to see Hayley and I think both Hayley and the residents left happier when we went home. My cousin worked in DHS in nursing homes, assisted living facilities in Texas for 25 yrs. He could not believe both the beautiful facility and the friendly staff at Tamarack. I don't think Mom could have been in a better place than Tamarack Assisted Living Center. My folks have been residents at TALC since 2005. As other reviews mention, it is a very nice facility and they have a great staff. During the time they’ve been there, both of my parents had to spend a few months in a nursing home and were then able to “move back home” to Tamarack. It’s a load off our minds knowing that they’re well taken care of. Our family certainly recommends TALC for someone needing assisted living care. Thanks! My mother, who lived in another state, just recently moved into Tamarack Assisted Living. It is a well run, clean, caring place. I have not encountered any employee that wasn't happy when they greeted any of us, including my mother. All employees have been so helpful in helping her make this transition. We are very happy we made Tamarack our choice. My brother was a resident of Tamarack for three years. He, as well as the entire family, found Tamarack to be as close to home as home could be. All the staff, nurses, and aides were extremely caring and we never worried about his welfare. He enjoyed his stay there. Our family highly recommends Tamarack Assisted Living. I was so impressed by the warm, friendly, clean environment of Tamarack. I was will to consider a reservation for myself - not just a family member or friend. Love the staff. My mom is a resident at Tamarack and has been there over 1 1/2 years. Honestly, I have never seen her happier. She does things now that she had never done before in her life. Plays games, volunteers, gets out and about, and loves helping others. She frequently tells me how much she enjoys being at Tamarack, loves the people, and the staff. The facility is very clean in all manner and the staff is truly wonderful. All are friendly, professional, and above all, caring. I often go by at different times and days and find it always consistent. A person would be hard pressed to find a nicer place to live for themselves or a loved one. What a wonderful facility! It is clean and well managed. Most of all, it is full of caring people who have tons of patience and positive attitudes. Describe the overall population of assisted living residents at Tamarack Assisted Living Center. What is their average age? What are their favorite things to do? We have residents who are in their 70's, 80's, and 90's. Our average age is about 85. Many of our residents love to play bingo and attend our horse races that we have as a regular activity. They win Tamarack Bingo Bucks to spend at the Tamarack store. Residents enjoy musical activities and attending church which is held at Tamarack on Tuesday nights. We also have community activities that we provide transportation to, and residents enjoy being part of the community. What programs or activities does Tamarack Assisted Living Center offer to enrich residents' well-being? We offer organized walking and chair exercise. What transportation services does Tamarack Assisted Living Center offer to assisted living residents? We provide transportation for local shopping and appointments. We also provide up to three out of town trips to a doctor up to 60 miles away at no extra charge. How does Tamarack Assisted Living Center keep residents' families informed about their loved ones? We phone, use email, and face book to communicate with families. If there is something that a family needs to know immediately, we call. We have power of attorney and people to contact phone numbers readily available to staff. If Tamarack Assisted Living Center accepts dogs or cats, what indoor/outdoor areas can they enjoy? We do not allow pets to live at Tamarack, but pets may visit if they are on a leash, friendly, well-behaved, and if we have their shot records on file. What safety features or security measures does Tamarack Assisted Living Center provide to protect residents who wander? We are not a memory care center, and we do have a lot of outside doors. We are never locked from the inside so our residents are free to come and go. We do ask that our residents let us know when they are leaving so that we will know where they are going to be and not worry about them. Features Extra: Generator In Case Of Lost Electrical Power, State Of The Art Wireless Call System For Every Resident, Fire Safety System And Video Surveillance, Individual Apartment Heating And Air Conditioning. Financial Guidance Extra: We Report Needed Information To Long Term Insurance Companies. Tamarack Assisted Living's approach provides the ideal solution for seniors who may need some help with daily activities such as meals, housekeeping, transportation, bathing, dressing, and medication reminders. Tamarack focuses on wellness and keeping residents as independent as possible by providing a tailored plan of assistance. Our residents enjoy beautiful living spaces, delicious meals, engaging social activities, transportation, and personalized assistance and care. Tamarack residents say that the accommodating, friendly, helpful staff who are always ready to assist you are what makes Tamarack stand out above all other assisted livings. They also say that it's not home, but it's the next best thing. What should caregivers and potential residents know about Tamarack Assisted Living Center?